Four-Year Colleges in Washington D.C.
As one of the nation’s leading Catholic universities, Seton Hall offers over 90 highly ranked programs. We excel in the health sciences, with programs in Nursing, Physical Therapy, Physician Assistant, Occupational Therapy, and Athletic Training. Plus, we have top Pre-dental and Pre-medical programs. In fact, 93% of our Pre-med students get into medical school. • Ethics and Applied Ethics? • Legal Studies in Business? • Russian and East European Studies?? • Women and Gender Studies? In July 2018, Seton Hall University opened a new School of Medicine in partnership with Hackensack Meridian Health, a system of 16 hospitals and 450 patient care centers, including the #1 rated hospital in New Jersey. 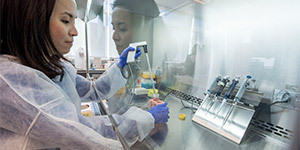 Twenty-five percent of the seats in the School of Medicine are reserved exclusively for Seton Hall graduates, and Seton Hall has designed an innovative Joint Bachelor’s/MD Program for incoming freshmen. To learn more about this program, visit shu.edu/jointmd. The new School of Medicine will be located on our Interprofessional Health Sciences (IHS) campus. It will also be the home of Seton Hall’s highly acclaimed College of Nursing and School of Health and Medical Sciences, which offers programs such as Athletic Training, Occupational Therapy, Physical Therapy, Physician Assistant, Speech-Language Pathology, and more. This interprofessional learning environment will create an innovative, team-based approach, which will greatly advantage the ability for all our students to work collaboratively, improve patient care, and be better prepared to enter a health care profession. The IHS campus is located on the border of Clifton and Nutley, New Jersey, only 20 minutes from Seton Hall’s South Orange campus. With a 14:1 student-faculty ratio and an average class size of 21, faculty know more than just your name. At Seton Hall, you can begin working on research projects with faculty as early as your freshman year, and many students even attend conferences with faculty. You’ll benefit from the close mentorship of faculty and a community dedicated to challenging and supporting you. Seton Hall is a Catholic university with a more than 160-year tradition of excellence. Seton Hall values integrity, compassion, and a commitment to helping others. A diverse and welcoming community, Seton Hall embraces students of all faiths and inspires students to become servant leaders who make a difference in the world. Nestled in the suburban village of South Orange, New Jersey, Seton Hall provides the safe, quaint charm of a small town and the hustle and bustleof New York City life only 30 minutes away. Just hop on the train inthe center of town and the worlds of entertainment, art, publishing, finance, and fashion; the United Nations; and thousands of major corporations are at your doorstep. This translates to a career edge and unprecedented job opportunities, not to mention lots of career advantage. 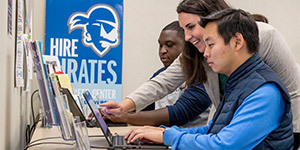 Seton Hall offers more than 17,000 internship opportunities, and more than 81% of students have an internship—or two—on their résumé before graduation. In fact, Seton Hallis ranked #4 in the nation for providing internship opportunities. Seton Hall students have an employment rate of 90% and mid-career earnings 50% higher than the national average. Seton Hall offers a comprehensive Career Center, and your career counselor begins working with you freshman year. “I loved every minute of the Seton Hall program. I was in five different clinical settings, getting a firsthand look at the kind of career I wanted to pursue. 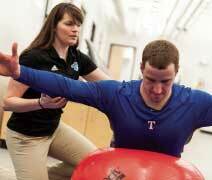 I feel extremely confident in my abilities to help athletes achieve their very best."